How customizable can the Moto X possibly be? Update: ABC News reports that customization options will be purely cosmetic, letting customers choose the colors, custom engraving, and personalized wallpaper. 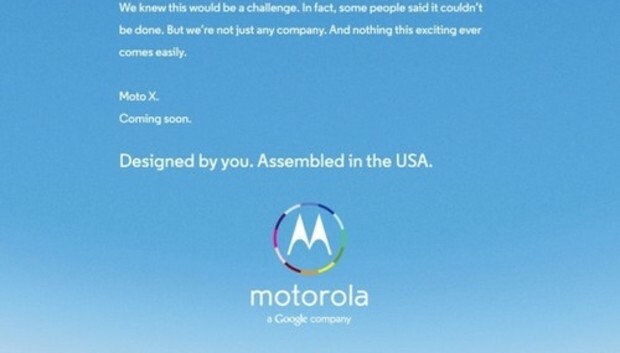 Motorola sparked more questions than answers on Tuesday when it hyped the upcoming Moto X as "the first smartphone you can design yourself" in a full-page newspaper ad previewed by Ad Age. There were already questions about whether the Moto X would be a top-tier smartphone capable of challenging the iPhone and Samsung Galaxy S4, or a more modest, mid-range handset. But now with Motorola's ad hitting The Wall Street Journal, The New York Times, The Washington Post, and USA Today on Wednesday, it sounds like anything's possible. We already know that the Moto X will use its sensors to adapt the handset's interface for different situations, like taking the phone out of your pocket or traveling in a car. There have also been a few rumors about fancy high-tech features like always-on voice activation, and predictive capabilities that can anticipate when you want to take a picture or check the time. But a phone you "can design yourself"? It's a marketing tease that could either pay off in positive mindshare dividends, or leave Motorola looking like it over-promised. It all depends on the hardware that eventually hits market. The phone will reportedly have a 1.7GHz dual-core processor, 2GB RAM, and a 720p display. Speculation about other specs is more varied with some rumors saying the phone will have a 4.6-inch display and others hyping a 5-inch screen. There's also some disagreement on whether the phone will have a 10- or 16-megapixel rear-facing camera. Perhaps these points of disagreement are a hint to what kind of options we can expect with the customizable Moto X. Is Motorola, as the ad suggests, seriously pondering a Dell-like ordering experience that lets you handpick the phone's key components? "My feeling is that this is more a marketing move than a new business model similar to Dell," says Carolina Milanesi, research vice president for consumer devices with analyst firm Gartner. "It could be as easy as picking your cover material or even designing your cover." Many phones also offer you a choice of onboard storage, but Milanesi says anything like choosing different processors or screen sizes gets way too complicated. "You might as well come up with different models and put them on the market," she said. For the most part, that's what phone makers are doing. Apple currently offers three different storage sizes with the iPhone 5. Samsung offers two sizes of onboard memory for the Galaxy S4, depending on the carrier. Beyond that, the Korea-based phone maker creates various models of its Galaxy line with different selling features such as the water-resistant Galaxy S4 Active and the smaller S4 Mini. There are also reports of an LTE Advanced model coming to Asian markets in the coming weeks. Nokia has pioneered customizable phones since the late 90s when the Nokia 5110 was sold with a variety of swappable colored cases called Xpress-On Shells. The cases were water- and dust-resistant and let early cell phone users choose from seven different colors. Nokia continues that tradition today with a number of Windows Phone 8 Lumia phones that offer swappable backs such as the Lumia 520 and 820. Swappable colors, memory upgrades, and sometimes engraved backings are as far as major phone makers have been willing to go with offering customizations. There's good reason for this says Stephen Baker, vice president of Industry Analysis at The NPD Group. "When a product becomes mass market, the internals are much less important to the vast majority of consumers," Baker says. "I would question why you have to customize [smartphones] to individual consumers since we are currently mass customizing these products already, such as the variety of models that the Samsung Galaxy S4 now comes in." Patrick Moorhead, founder and principal analyst at Moor Insights and Strategy, contrasts the customizability of phones with PCs: "Unlike the Dell model that has plug-and-play options for PCs like swappable graphics cards, with a phone everything is soldered onto one [printed circuit board, or PCB]." Moorhead argues that having multiple PCBs lying around in inventory to cover a variety of possible hardware options is simply too expensive to be practical. Moorhead's argument notwithstanding, there actually were two companies that did try to sell highly customizable smartphones. In 2008, zzzPhone, an American company with factories in China, advertised phones built with "the same high quality components as major brands Motorola, Nokia, Palm, and Samsung... at less than half the price." The zzzPhone options included an optional GPS upgrade, a maximum 7-megapixel rear-facing camera, up to 4GB onboard storage, and an upgrade to "stereo speakers." You could even upgrade the phone's processor. But a month after zzzPhone hit the news, the company was already hitting production snags, and the product eventually fizzled out. Next up was the German company Synapse-Phones. In 2010, its Synapse One advertised even deeper customization than the zzzPhone. Synapse-Phones offered a choice of 3G or 4G quad-band radios, Bluetooth 2.1 or 3.0, a 5 or 8 MP camera, an LED or Xenon Flash, and a maximum 32GB capacity SD card slot. The Synapse-One also offered add-ons such as mini HDMI, FM radio, and mobile TV. €299 (about $380). Alas, similar to zzzPhone, Synapse-Phones was not meant to be, and the company fizzled out in early 2011 having never shipped a phone. Now, we come to Motorola. Could the company seriously be considering customizing your phone's innards? That's what the Android-focused site Android and Me reported in March during one of its regular rumor dumps wherein it dishes on everything it has heard about upcoming phones. The rumor was later said to be debunked, but perhaps the site was dead-on after all. A few days after the Android and Me report, newly hired Motorola advisor Guy Kawasaki posted a YouTube video to his personal Google+ page. The video was an inside look at how Porsche customizes its vehicles for customers, and, in his comment accompanying the post, Kawasaki asked, "Wouldn't it be great if you could personalize your phone like this?" Hints and rumors, aside, there's no getting around the difficulties involved in deep customization. "It is a niche opportunity that would add cost and complexity to the manufacturing process," says NPD's Baker, arguing that only the most technically savvy customers would be interested in deep phone customization. "I don't see a lot of future here." The Moto X is expected to launch this summer.